This is a professionally drawn personal guarantee agreement for a lender to put to a company director as a condition of either increased lending or forbearance in enforcement of existing loan conditions. First, it identifies an original loan agreement between the lender and the company, then ties the guarantor to it, to “stand in the shoes” of the company in the event that it was unable to make repayment when due. The agreement provides many options primarily to strengthen the position of the lender. Some could be deleted so as to provide a softer agreement for the guarantor if required. 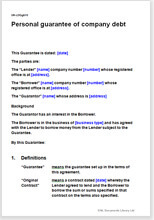 The key benefit of using this document over adding a guarantee paragraph to the original contract is the simplicity of use. There is no need to edit and agree the original contract. That means less room for making a mistake and invalidating some provision of it. Provides heavyweight protection for the lender. The document highlights the continuing liability of the guarantor (usually the director who is personally liable for the company debt).